Most of the ftpg. is taken up with: "Sketches of Events From the Capture of Toulon to the Surrender of Amsterdam". Most of pg. 2 is also taken up with European affairs. 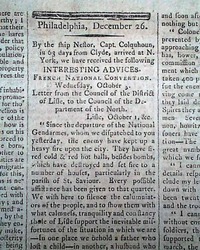 DUNLAP'S AMERICAN DAILY ADVERTISER, Philadelphia, Dec. 26, 1792 Inside has over 5 columns taken up with: "Interesting Advices, French National Convention" with a considerable amount of information concerning the on-going French Revolution. 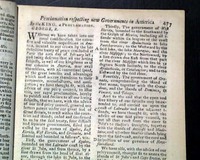 * American Independence complete ? 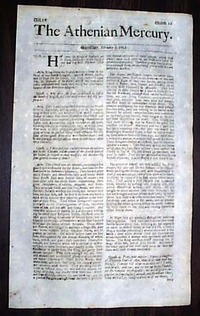 All of page 6 and a portion of page 7 are taken up with various reports from the House of Lords, which include several discussions concerning the granting of independence to American colonies (see). 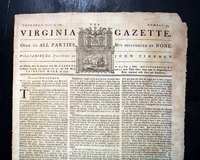 THE LONDON GAZETTE, a lot of five (mostly) 2nd-rate issues of this famous newspaper, one each from 1777, 1778, 1779, 1780, and 1781, covering 5 years of the Revolutionary War. 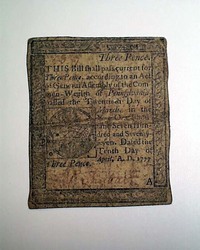 Although no direct war content is to be found, they are great period items giving a nice perspective of life during this formative period in world history. Most are 4 pages, and measure about 8 by 11 inches. 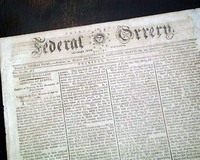 This newspaper features one of the larger & more decorative masthead engravings to be found in a colonial America newspaper. 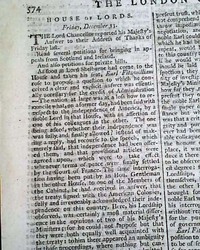 THE LONDON CHRONICLE. 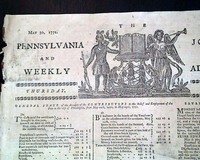 A collection of ten issues, one from each year 1763 thru 1772, crossing the critical period from the just prior to the Stamp Act to just before the outbreak of the pre-Revolutionary War tensions. Each 8 pages & in nice condition. 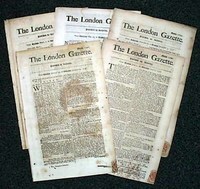 THE LONDON CHRONICLE, London, 1760's A lot of 10 issues of this famous & popular newspaper at a bargain price. 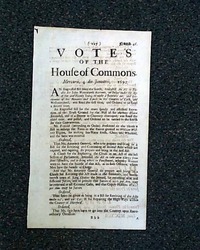 A good set to show the state of affairs in England and the world shortly before the American Revolution. 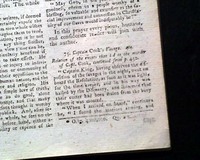 All are complete in 8 pages, 8 1/2 by 11 inches, & are in nice condition. 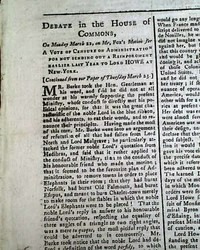 The issue begins with a: "...Satyrical Description & character of the Celebrated M. de Voltaire...". 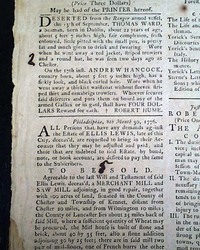 THE POST-BOY, London, 1723-1726 A very nice single sheet newspaper featuring two handsome engravings in the masthead (see). Various news from Great Britain and the continent of Europe, plus a partial red tax stamp on the reverse. 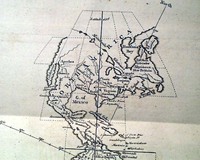 Measures about 14 1/4 by 8 1/8 inches, nice condition and great for display. 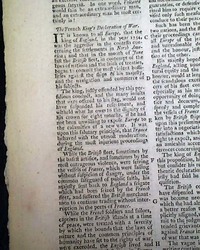 THE POST-BOY, London, 1720's (2nd-rate) A lot of 5 issues of this early title with the great masthead containing two engravings. Lightly inked or other minor problem causing them to be a bit '2nd rate'. Offered at a considerable discount. 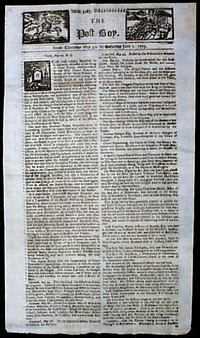 The generic photo shows what the newspaper looks like when in good condition. 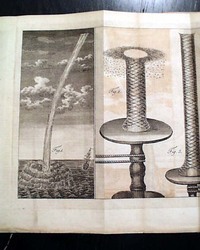 THE ATHENIAN MERCURY by John Dunton, London, England, 1695. 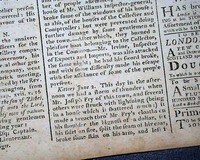 This was a fine gentleman's newspaper which was very popular in the coffeehouses of early England. 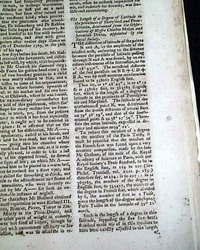 Interesting reading on a wide range of topics & one of the earliest periodicals in English. Partially in question/answer format. 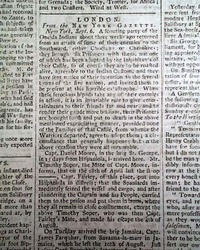 This newspaper was published before any American newspapers even existed. 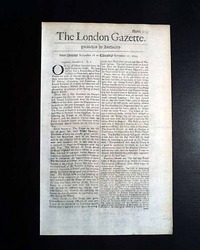 THE LONDON GAZETTE, 1690-1696 An opportunity for a genuine issue of the world's oldest continually published English language newspaper, having begun in 1665 & is still publishing today. 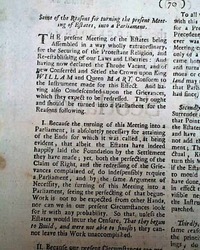 This issue is well over 300 years old. 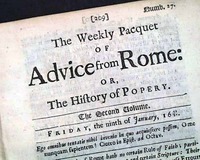 THE WEEKLY PACQUET OF ADVICE FROM ROME, OR THE HISTORY OF POPERY, London, 1679-1682 An unusual anti-Catholic newspaper which had a short life before being suppressed. Measures 5 3/4 by 7 1/2 inches and in great condition. The issue shown in the photo is generic; the issue you receive will have a similar but different date from the years noted.